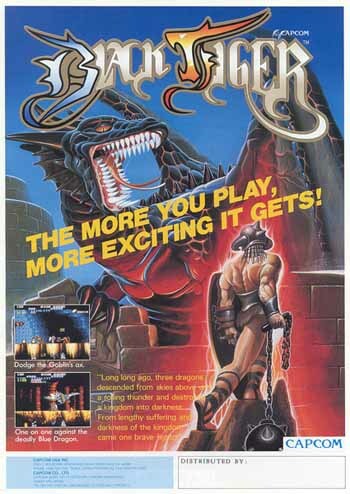 The flyers for Black Tiger are pretty standard late 80's fare. They're probably a bit more accurate than some. The artwork actually follows the in-game graphics quite closely, if you ignore BT's costume change and the Orc below who looks significantly shorter than his better proportioned in-game chums, maybe this fella was the runt of the litter? They also forgot how to spell Zenny, I put that down to lack of passion at the ad company. Leasure and Allied cabinets (which were almost ubiquitous around Perth) usually without stickers or control decoration, just the game's marquee. original image source: www.arcade-history.com and www.klov.com. Romstar's version of the marquee takes credit for diverging much further from in-game graphics, its dull and drab with lousy artwork, some of that is down to printing constraints but nonetheless it's not pretty. Ole' Blackie looks quite the dandy in that dainty weskit and blue budgie smugglers. Above (bottom left): A better marquee I found on the net then tweaked in Illustrator. Download the scalable/printable/tweaklable Illustrator file. original EPS file source: www.localarcade.com (now defunct). 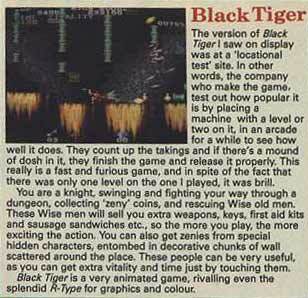 Way back in 1987 I didn't read many gaming magazines so I experienced Black Tiger in a vacuum and came to my own conclusions. Its nice to see that reviewers thought postively of the game even if they were'nt jumping up and down shouting its merits from the rooftops. A few years later I started buying issues of Zzap!64 and looked forward to the monthly dose of humor these Brit-centric mags delivered. Zzap reviewed the C64 and Amiga ports in Issue 62, June 1990, p.68. "What could be worse than 100mph winds, hall, and snow spoiling spring? How about three hideously evil dragons, breathing fire, and pestilence all over your previously peaceful province? Well it's happened, and in the wake of all the destruction has come a deluge of dastardly demons determined to destroy all. That's where you come in: the famous Black Tiger who – to judge from your sprite – are neither black nor feline. What is obvious is that you like fighting and cash, so clearing the land of evil is right up your street. The game is divided into six levels, horizontally and vertically scrolling with plenty of treasure rooms to be found. In fact the cash, known as zenny (as in Forgotten Worlds), is carelessly left all over the place. You can also open treasure chests with keys, and free Old Men frozen into statues by touching them – a good deed which has its own reward, i.e. extra time, money and vitality. More wily Old Men will try and sell you improved weapons, armour, keys and potions. You already come equipped with a mace to bounce off baddies' bonces and numerous knives to throw. Stocking up on equipment is a good idea as each level has a particularly vicious baddie at its end: these include a Blue Samurai Dragon(! ), a Block Head (but no Ian Dury), and Spear-Throwing Demons." After US Gold's previous CP conversions, the excellent Strider and Ghouls 'N' Ghosts, this is a disappointment. But I don't think it's wholly the fault of the programmers: technically this is an okay conversion. It's mainly because the Black Tiger coin-op wasn't all that special in the first place; just a repetitive kill 'n' collect game. Out of the two conversions the C64 game is marginally the better with some decent sprites and a nice tune playing throughout. The Amiga version is not at all impressive, featuring jerky scrolling and unspectacular end-of-level baddies. 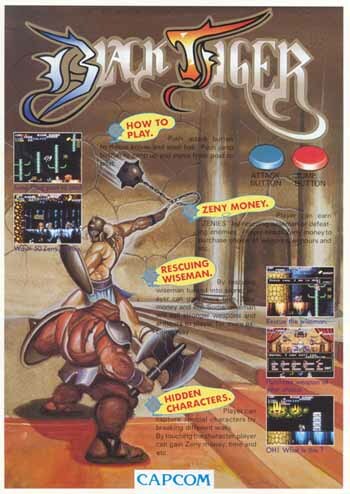 And though Black Tiger does have some short-term playability it's certainly not one of the better Capcom coin-op conversions. - PK. Black Tiger was the first Capcom coin-op to use their new CP graphics system, demonstrating great potential in shading, detail and movement. The Amiga game captures the approximate look of the machine, but it's a ST port-across and the tiny sprites and bland backgrounds never really surprised me. A pity since the game design is so unimaginative, with you simply hopping around platform-packed caverns. Buying armour and weapons adds a small tactical element to the game, but finding your way through the caverns within the time limit soon gets very repetitive and dull. The C64 game plays slightly faster, though this plus is neutralized by the inevitable multiload. Graphics are okay but not amazing. And though there's nothing wrong with Black Tiger, neither is there anything special enough for me to spend any of my 'Zenny' on it. - S.
So Zzap wasnt too impressed with old blackie in any of its forms, I guess we'll have to agree to disagree on whether "Black Tiger coin-op wasn't all that special in the first place; just a repetitive kill 'n' collect game". Crash was the alternative/competition, and us loyal Zzap! readers were conditioned to despise them and their readership. In truth, I would've bought all the magazines if I'd had the money. The quality of writing was very high and the personal computer industry was still in its infancy with something new and interesting was happening every issue. "A barbarian hero jumps and fights his way through a variety of colourful, enemy-packed levels in this spiritual successor to the Capcom classic Ghosts 'n Goblins. The sprawling, eight-way scrolling levels are packed with hidden bonuses to encourage and reward exploration. Most of these bonuses are in the form of 'Zenny coins'; currency that allows the player to buy such items as an upgrade to their weapons and armour, keys for treasure chests, and anti-poisoning potions. Special items that reveal coins, upgraded armour, or simply bonus points may be found by attacking certain walls. The Japanese version (Black Dragon) has a few changes that makes it more challenging than its American counterpart. Several of the "falling rock" obstacles were added in this version. Additionally, the prices of many of the items are higher. But perhaps the biggest difference is related to fighting the later bosses (the 3 dragons and the dual sword wielding foes at the end of stages 5 and 7). In the American version, it is possible to duck and avoid taking damage when the bosses touch the player's character as long as one of their projectiles doesn't hit him. In the Japanese version, the player is not able to do this."